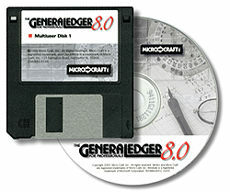 Our Windows General Ledger for Professionals, version 8.0d, has just been released and is now shipping. It completes the trio of Windows financial packages (Verdict 10, CheckWrite 8.0c and General Ledger 8.0d). The General Ledger manual has extensive information on setting up general ledger journals and establishing a general ledger chart of accounts. There are worksheets to help you set up your chart of accounts, and example charts of accounts for a professional corporation, partnership and sole proprietorship. And we teach you step-by-step how to use the General Ledger. Most law firms find it very important to see financial statements while the information is still current. When you run your own general ledger system, you don't have to wait. You can have an Income Statement and Balance Sheet, plus all backup information, within a day or two after the end of the month. This helps you assess the firm's financial situation and plan for the months ahead. If you have Verdict, General Ledger and CheckWrite, it's quick and easy.